We are living the “mobile first” era and mobile marketing is gaining more power day after day. In the time you have quickly read these words, millions of messages have been sent, push notifications received and online orders purchased. Customers gradually became more aware and demanding, but that’s an amazing news. It means that creativity, personalization and outstanding contents returned as essential in every marketing strategy. The other incredible news is that we have all the necessary tools to put them in practice. That’s why everyone should better understand how powerful rich push notifications are. Please note this is not a standard article and the adopted point of view is the one of an average client. Which means, in the next paragraphs you are going to learn more about your best friend. I read people spend on average between 3 and 5 hours per day on their mobile, which, I counted, means 155 hours per month and 1860 hours per year. Wait, are you saying I spend more than half of the time I carefully invest in pure and restoring sleeping, in scrolling my mobile every day? Oh. Seriously?? Woooow! Excuse me, I just received a notification that my favorite band is playing in town next month and I do want to book the tickets. Yes, mobile marketers, I am the client you should definitely catch! Let’s see why. I own a smartphone, like another 5,134 billions of smartphone users around the world. And I do have a conflict relationship with technology, like the 47% of American smartphones owners who recently stated they’re trying to reduce the use of their phone. Nevertheless, I can’t remind the last time I forgot my mobile at home in the past 6 years. On top of that, I recently counted 12 apps installed in my mobile, only 5 I frequently use. I am wondering if I should uninstall some of them to free some space… But wait, are you saying I can get an alert when flight tickets for San Francisco are on sale?!? I was just thinking to go next summer! Sure, keep me posted. And voilà. You opted me in. The first time I received a push notification I was surprised. It wasn’t a standard alert from any social media I was used to see. Not that time. That time was a breaking news about another earthquake in Italy. Did I mention I got obsessed with earthquakes some time ago? Yes, my most visited website has been earthquakes.com for a while and that’s why I felt kind of special when I read the news. I guess it’s the same excitement journalists experience when they find a scoop. A couple of days later, I got another alert regarding a new Picasso exhibition in my city. Picasso is my favourite painter. An then another, and another, and another. After a while I started understanding. The news application I had installed was selecting for me the most relevant news based on my interests and was sending me notifications. I loved it. It was like having a personal consultant perfectly knowing all my tastes. I was wound up. Well, I realized push notifications play on me a mix of excitement for “being the first” and sense of imminence to maintain this primacy. If you add to this a very catchy video, trust me, I am totally yours. Which explains very well why I recently bought a 30% discounted iron after Amazon notified me even if I’ve never ironed before. And this explains even more the power of rich push notifications. But the fact remains that I do have too many unused apps installed, so, listen carefully: if you don’t want me to uninstall yours, aim for this sense of uniqueness I like so much and court me. 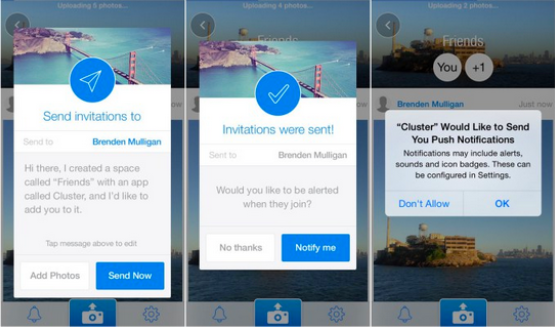 Researches say 50% of smartphones users appreciate notifications, especially if they are personalized. But notifications can be also tricky, you know that. Few are awesome, a bit more than few are borderline, many are a dead-end road. 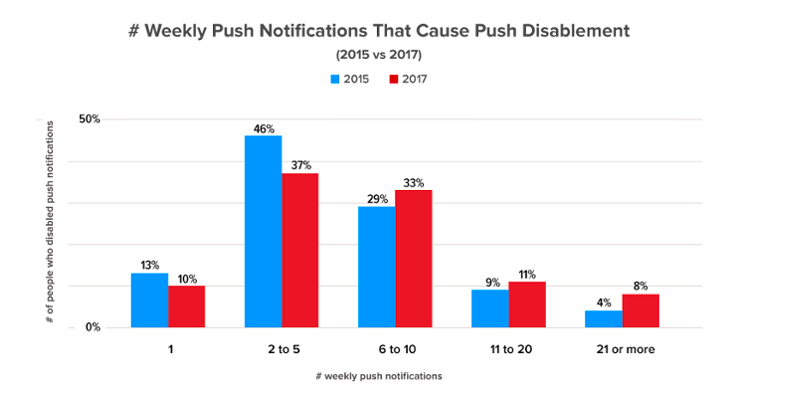 For instance, 37% of users disable push notifications if too many are sent. Too many is generally between 2 and 5 notifications received per week. Like in love, less can be really more. Good news for you, users also wait before stop using the app till 6-10 notifications are sent weekly. Being part of the analyzed sample I can say that, yes, you have another chance to keep me with you. How? Treat me well. Studies say the average opt-in rate is about 72%, 100% for Android, 43% for IoS. Are you wondering what to do with the other 28%? That’s so simple. Think of every single user as you thought of me. Again. And again, and again. 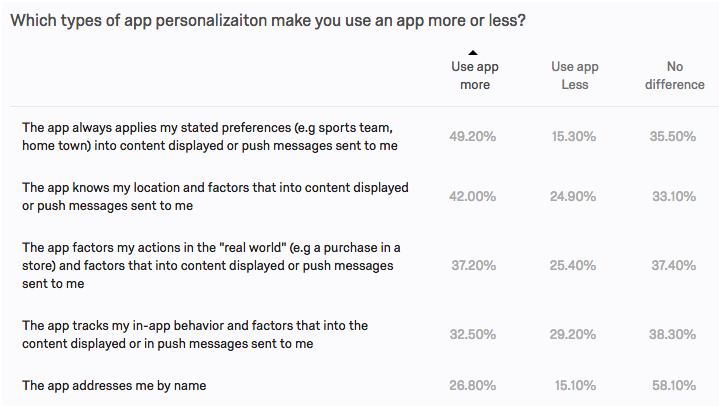 For instance, personalization encourage the app usage. 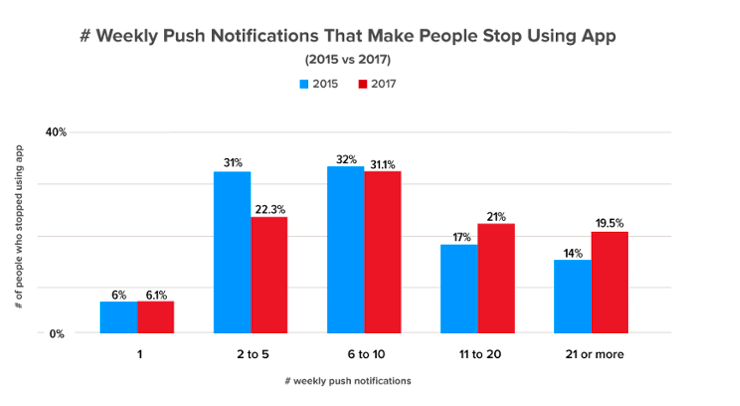 That’s why rich push notifications should be primary in every mobile marketing strategy. In fact, rich push notifications allow you to send custom alerts with videos, images and Gifs, enhancing the engagement of your clients up to an extra 88%. PushCamp is a modular and scalable service to create Standard and Rich Push Notification campaigns. Thanks to PushCamp, you can create the content of your campaign for both Android and iOS in minutes, and segment your target audience by importing your contact list or by creating it from scratch through custom parameters – so to offer your clients the level of personalization they expect and appreciate. Once your message and target are up, you can schedule the campaign according to a time scheduling or automate it if specific events occur. Detailed reports will help you analyzing your performance and get better results; everything from a single interface. That notification you just received from your mobile provider? Yes, we sent it. Contact us to find out more about PushCamp! PS: And now I’ll tell you a secret. I am a marketer as well.